I should preface this recipe with a little back story. When I first met Taylor his favorite food on the planet was buffalo chicken calzones dipped in ranch dressing. Typical college boy food but in reality, who doesn’t love a good buffalo chicken dish now and again? Taylor’s diet has changed quite a bit over the years (farming has influenced that) but he will forever and always hold a special place for buffalo chicken in his heart. This past Christmas Taylor decided that instead of a Christmas gift all he really wanted was a homemade buffalo chicken dinner and a six pack of nice beer. Have I mentioned I married a very simple man? Always up for a challenge and making my husband happy I decided to get to work. The beer was easy, but I wasn’t sure I could handle making the calzone (I knew I’d mess up the dough somehow!) So instead I opted for a hearty stew and crossed my fingers while I got busy preparing it. This may seem like a Sunday football meal (which it totally is!) but this special chowder is what Taylor and I enjoyed on Christmas night at the farm. In fact, this may be the same chowder we enjoy every Christmas from now on. The truth is, I freaking nailed this one folks! 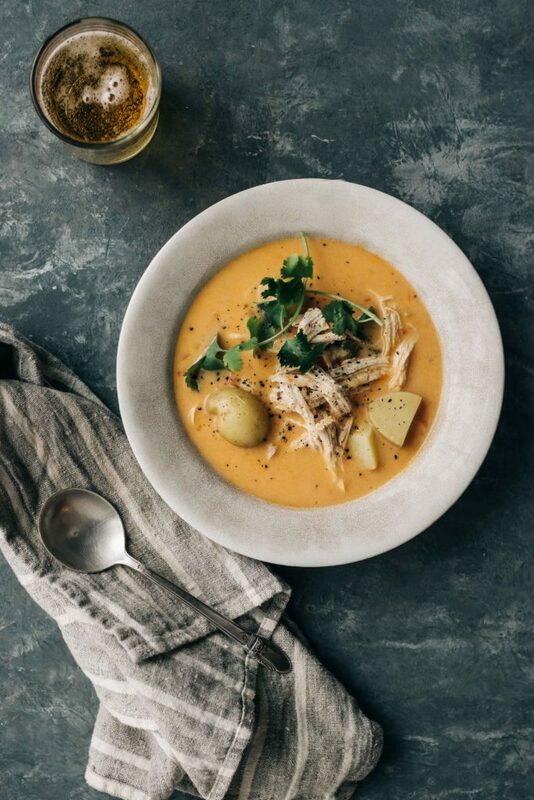 With plenty of hearty vegetables, organic chicken, hot sauce and creamy coconut milk this is a chowder that I can get behind. I hope you all give this a try. It’s a keeper and perfect on these chilly winter nights. Cheers to new traditions, less gifts and more quality time enjoying the simple pleasures in life. Grab a spoon, pour a pint of your favorite beer and dig in! Heat the ghee in a large soup pot over medium heat. Add the onion and cook, stirring occasionally for about 5 minutes. Stir in the garlic, celery, peppers, and potatoes. Cook for about 2 minutes longer. Add the chicken breast, hot sauce and broth. Bring to a boil. Reduce heat to medium-low and place a lid on the soup. Simmer until the chicken is fully cooked and the potatoes are soft. About 25 minutes. Remove the chicken from the pot and place on a cutting board to the side. When it's cool enough to handle use two forks to shred the chicken. Keep the chicken to the side. Use an immersion blender (or carefully transfer half of the soup to a blender) and blend until about half of the soup is creamy, still leaving a lot of the veggies chunky for texture. Return the chicken to the pot, add the coconut milk and stir until well combined. Season to taste with salt and pepper and keep warm until ready to serve. Serve with a squeeze of fresh lime juice, minced cilantro and diced avocado. Let me know how it turns out for you guys Jim!!! Making this for sure!! Too bad I’ve just made tomato! Cold rainy day here in pdx so I thought i’d give this soup a try. It did not disappoint. Actually it surpassed all expectations in the flavor department. I thought it might be too spicy but not. I think it would also work without the chicken for those meatless lovers. Making this tonight and it smells AMAZING!!!! Just made this chowder for supper. Delish. Will put this in for soup rotation this winter. This was pretty good the first day, but man oh man was it amazing on day 2! Thanks so much! This is a very tasty recipe, hubby said it reminded him of Laksa. This is one to save. Have a great trip. I’m a Subaru convert after being a Volvo lover for 22 years…. Absolutely delicious! Thank you for this one. yay! so happy you loved it as much as we do!